Former Tucson Mayor Tom Volgy addresses PDA members and other Tucsonans. 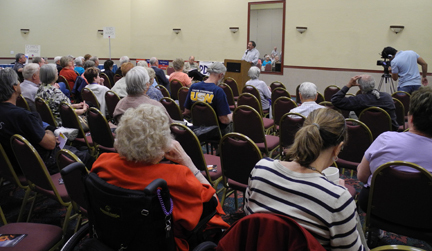 More than 60 Southern Arizonans turned out last night to hear two UA profs politely duked out the open primaries question in adebate sponsored by theProgressive Democrats of American (PDA) Tucson Chapter. Before an attentive crowd, former State Representative (and self-proclaimed recovering politician) Ted Downing (below) argued for open primaries. 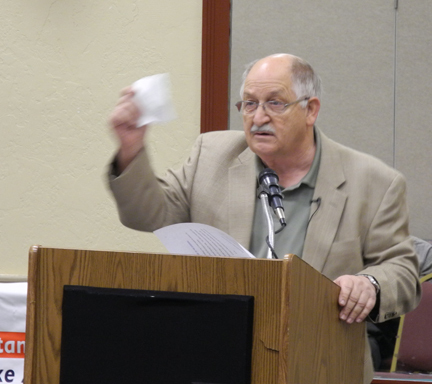 Speaking against was former Tucson mayor Tom Volgy (above). Each speaker was given 15 minutes to make his case, followed by one five-minute rebuttal each and questions supplied by the audience. Both men agreed that our political system needs reform, that big money is a corrupting influence, and that fighting against Citizens United is imperative. Volgy said thatfight should be won before we tinker with an experimental system like open primaries. Downing said that Arizona should continue along the American tradition of broadening the electorate– pointing out that originally only landed white men could voted, then unlanded men were added to voting rolls, then black men, then women, then 18-20 year-olds. One of the biggest differences between them was on the question of disenfranchisement of voters. Currently in Arizona about one-third of voters are registered as Independent (ie, no party); nationwide, according to Downing, 40% of voters are registered as Independent. Downing made a strong case that those voters have a lesser voice in government because they don’t belong to one of the two major parties. Volgy skirted the disenfranchisement question until he was directly asked about it by a member of the audience. He agreed that it was more of a hassle for Independents to vote in the primary, since they have to choose a party and request a ballot, but they are allowed to vote. In the presidential race, Volgy said Independent voters will be courted by both major parties. The attendees voted before and after the debate. Before the debate, the audience was more or less split evenly on the question, with a large number of “undecided” voters. After the debate, the “no” side of the question had swayed more voters than the “yes” side, and there were far fewer “undecided”. The Open Elections/Open Government group is gathering signatures to put the open primaries initiative on the November 2012 ballot. Under the current system, Republicans and Democrats hold separate party primaries (funded by taxpayers) to elect their candidates. Democrats vote in the Democratic Primary; Republicans vote in the Republican Primary; and Independents must request one ballot or the other. One winner from each party then competes in the general election. Under the top-two primary system, all primary candidates–- regardless of party affiliation–- participate in the same primary, and anyone can vote for anybody– no party restrictions. The open primaries initiative is not the same as “non-partisan” or “no labels” because candidates can choose to identify themselves by party on the ballot (ie, “registered as Democrat,” registered as Green,” etc.) The top-two vote-getters–- regardless of party– compete in the General Election. The open primaries system, if adopted, would apply to all primary elections in Arizona– except US president. As the election draws nearer, we will undoubtedly hear more about the open primaries question. Stay tuned. To watch the debate, check out these YouTube videos. This entry was posted on April 27, 2012 by Pamela Powers Hannley in 2012 elections, Arizona, campaign financing, Clean Elections, democracy, Democratic Party, Elections, equality, Politics, progressive, Progressive Democrats of America, reform, Republican Party, Tucson, Video and tagged Arizona, Democrats, Independents, Nonpartisan, Open Primaries, Republicans, Ted Downing, Tom Volgy.